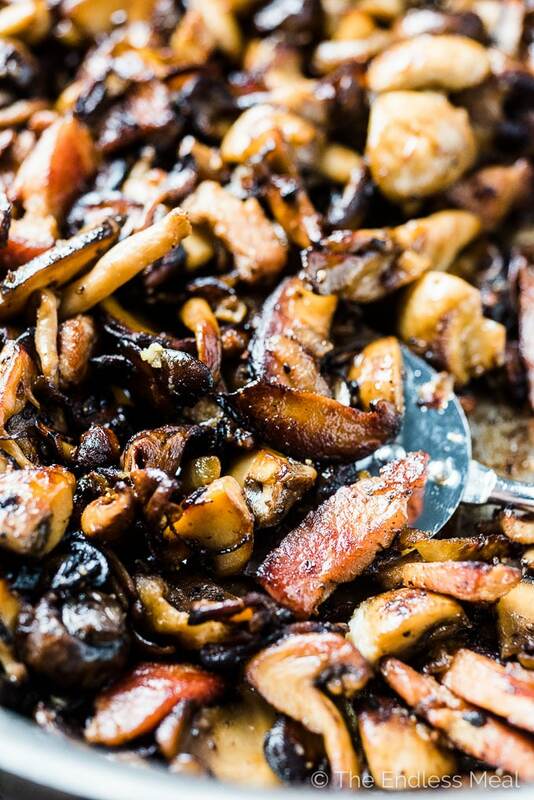 These crazy delicious Garlic Bacon Mushrooms are the ultimate side dish. They're easy enough to make as a weeknight side yet tasty enough to serve alongside a Thanksgiving or Christmas dinner. This recipe is also 100% gluten-free + paleo + Whole30 approved. Dig in, my friends! Today is International Bacon Mushroom Day, and we are all about celebrating it. Truth → I have no idea if it is, but if it's not, it should be. Want to join forces and create a new holiday with me? 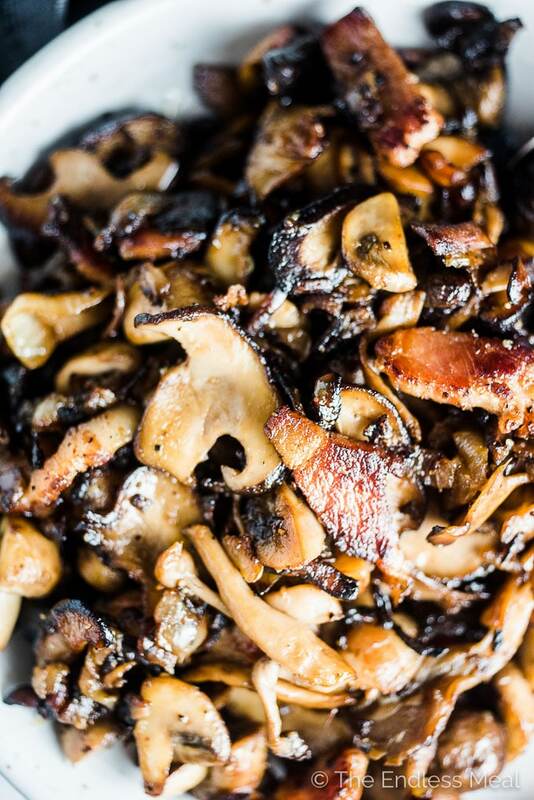 Or maybe we should make it Bacon Mushroom Month and maximize our opportunities to eat Garlic Bacon Mushrooms. Yep, let's do that. I need to thank my beautiful, talented, and always generous friend, Gaile Guevara, for giving life to this recipe. Before leaving for a recent holiday, she cleared out the perishables from her fridge and handed me two giant bags of food. It was like Christmas morning going through the bags. We scored wheels of brie, fresh microgreens, thick slabs of bacon, handfuls of wild mushrooms, cartons of eggs, and so many other things that I can't possibly list them all. We spent half a week playing the game What To Make With Gaile and Evan's Food. 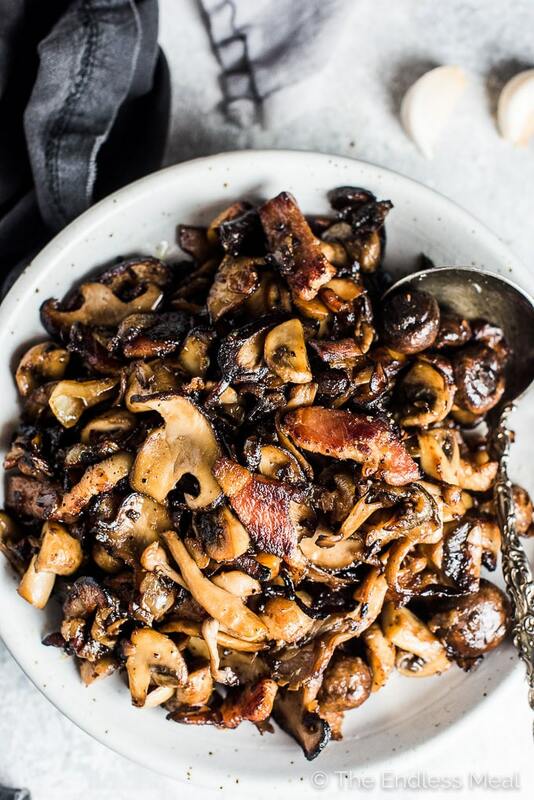 These garlic bacon mushrooms were born from those thick slabs of bacon and handfuls of wild mushrooms. The beauty of this recipe is its simplicity. If we don't count the salt and pepper (we don't, right?) there are only four ingredients here. Each one is packed full of flavor and can totally hold its own. Put them together and magic happens. This easy to make paleo + Whole30 approved side dish is one of those tricky recipes that let you think you're indulging when it's actually good for you. My favorite kind of recipe! 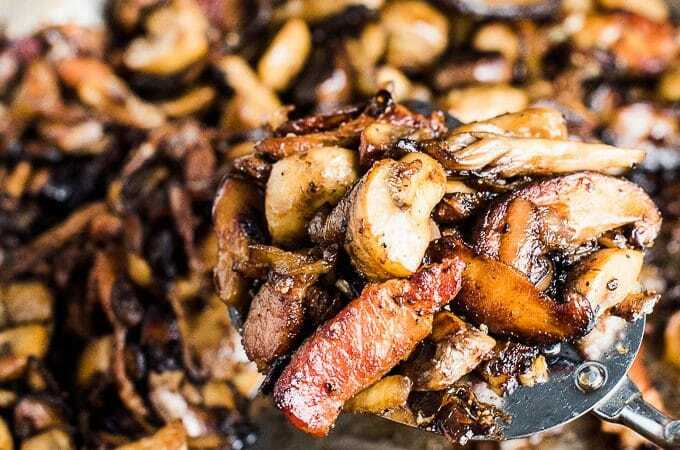 Garlicky bacon and mushrooms go just as well on top of a perfectly seared steak as they do beside a big salad and some pan-fried halibut. These mushrooms will team up well with pretty much whatever you serve them with. I've used a bunch of different mushrooms in this recipe as I like seeing them mingle together. Besides the button mushrooms, I chose some big, juicy Asian shiitakes (Chinese Black Mushrooms) and long, thin enoki mushrooms. The mix that Gaile gave me had some oyster mushrooms, shiitakes, chanterelles, and a few small crimini mushrooms. You could button or crimini mushrooms if that is what's available where you shop. If there is variety, I encourage you to pick up a bunch of different types and mix them all together. It's fun! Add the bacon to a large frying pan over medium-high heat. Let it cook until the fat releases and it is cooked but not crispy, about 10 minutes. Add the mushrooms and turn the heat to high. Let the mushrooms cook until their liquid has evaporated, about 6-7 minutes, then reduce the heat to medium-high. Add the onion and cook for 5 minutes more. Add the garlic to the pan and let it cook for about 1 minute. Season to taste with sea salt and black pepper. Do you cut the bacon into small strips before cooking.? That’s the way I do it. The other option would be to cook the bacon whole and crumble it. Your choice! I’m so happy to hear you love them! Can’t go wrong with these flavors. They were a hit! Classics are so good, aren’t they?! !